What could be better than celebrating the most sacred of ceremonies with the one you love most? Doing it all without breaking the bank, of course! Make no mistake, weddings are expensive, and can put you in a position where you’ll be paying back thousands for years to come. 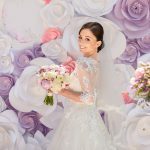 So how can you have the wedding of your dreams without all the debt? Find out! Heading into engagement season, it is all that is on your mind; the proposal, the ring, the planning, the dress and your friends want to be by your side for all of it. There are so many fun things to do with them during the planning to create lasting memories of the time spent together! Here are some of our favorites! In preparing decor for our photo shoots we come up with all sorts of ideas above and beyond flowers! We have done some super cute and cool things for our shoots, even some do it yourself options – checkout some of our ideas! At Bari Jay we shoot our dresses twice a year professionally, sometimes more depending on our needs, but our two big shoots are for the Fall and Spring lines. We just prepped and shot our Spring 2019 dresses, take a look behind the scenes! 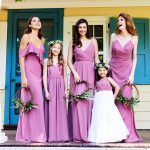 Bari Jay is always looking for Brides to talk about their bridesmaid choices! 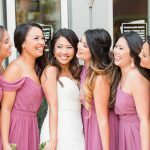 Alvie and Ton had a gorgeous wedding and we wanted to talk with Alvie about her choices. See what she had to say! 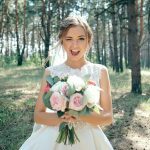 Great cost cutting tips for your wedding whether it’s your choice of venue, photographer, the food, bridesmaids attire or wedding favors take our advice, we’ve been there! 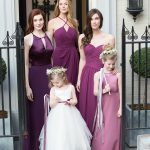 Being a female owned and operated bridesmaids business, we actually wear our dresses! When we do, we discover things that we never would have known had we not spent a fun night dancing, sitting, drinking, eating and even being pregnant at a wedding or party in one of our own Bari Jay dresses! When dressing your wedding party, you must decide if you want to be traditional or if you are trendy. Personally, we love the look of a traditional bridal party. Everyone in the same dress in the same color. 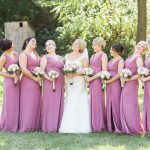 Traditional Bridesmaids companies like Bari Jay can make this possible as we offer maternity styles, jr bridesmaids styles, extra length or petite length and customizations that make your wedding unique to you and allow for your entire bridal party to be dressed and comfortable size 1-26W, shorter or taller, pregnant etc. We have been doing this for over 50 years!